Of course, fully autonomous “driverless” cars could be right around the proverbial corner, and rather than fear this technology, Americans ought to embrace it. Driverless cars could offer significant improvements not only in convenience but, more importantly, the potential for significant reductions in the growing roadway accident and death toll. 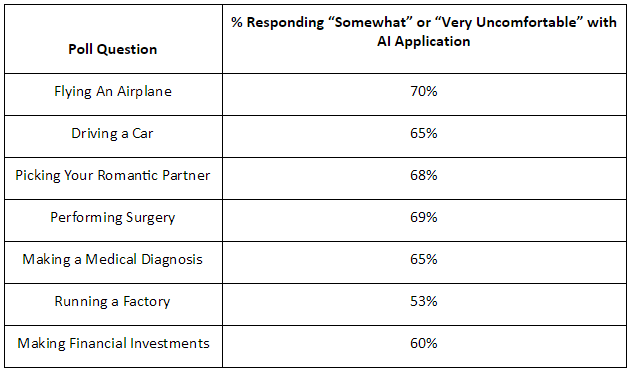 Similarly, 69% of people say they are not comfortable with AI helping to perform surgery, and 65% don’t like the sound of AI making a medical diagnosis. That’s surprising considering that, as Jordan pointed out in his earlier essay, several startups and hospitals are already doing just that with promising results. In New York, Memorial Sloan Kettering is already using IBM’s Watson to review stacks and stacks of clinical data on cancer and provide doctors with advice on treatment options for unique cases. Moorfields Eye Hospital in London partnered with Google’s Deep Mind AI platform to help physicians plan the treatment “map” for radiation therapy patients. The amazing, and perhaps counter intuitive, part of these efforts is that they have actually enhanced the human side of medicine. By allowing AI to assist with data processing and diagnoses, doctors have more time to focus on patient-oriented tasks. One of the most promising applications of AI is in the detection of fraud. Last year, MasterCard announced that it will employ AI to improve real-time approvals and reduce false declines. Javelin Strategy & Review estimated that the value of false-declines is thirteen times greater than the amount lost in actual credit card fraud and is a major source of frustration for customers. Using AI to lower the number of false-declines would be a major benefit for many card users. JD Candidate at Saint Louis University School of Law. I write about regenerative medicine, gene editing, and synthetic biology.